Looking back to the 80s through rose tinted riding goggles, they were great times. Despite that particular decade being responsible for yuppies, Filofaxes, giant shoulder pads, and the British manufacturing industry being decimated piece by piece. In the UK, the scooter scene, via the National scooter rallies, provided a welcome distraction for tens of thousands. After a week of hard graft there was little to beat jumping on your trusty scooter with the very bare essentials packed and heading for (usually) a seaside destination. Thereafter you’d spend a couple of days nonstop partying with like-minded people, a rainbow alliance of different youth subcultures united by one common interest; scooters. It wasn’t all quite so rosy though. Yes, greeting us after a long ride, there were invariably police roadblocks. ‘Scooters Not Welcome’ signs would be displayed outside many establishments, and some designated rally campsites early on in the decade had fewer facilities than a modern day refugee centre. Back then, we made our own entertainment when and where required, which was often. Bleak and depressing it may sound but for those of us who were there right through that decade, and beyond, they really were the best times of our life. Some of the many excesses were grass skirts, impossibly high hairstyles, matt black rat scooters and the rise in popularity of seriously modified scoots. 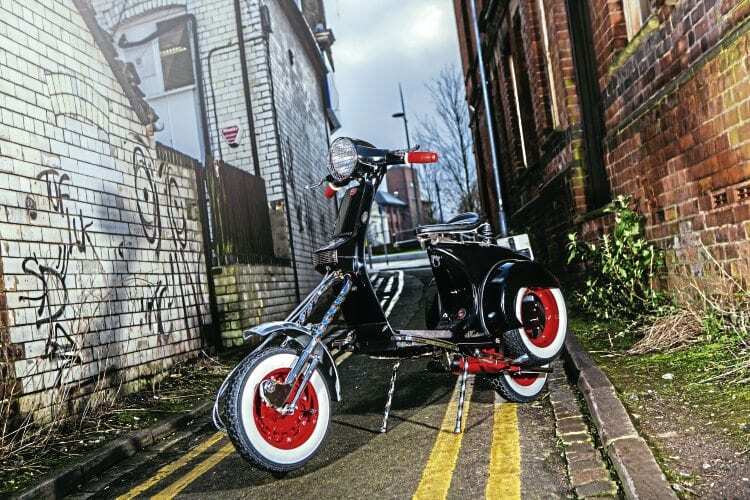 Cut downs, bone downs and skellys in various formats were inspired by the advent of scooter sport but built for road use. Also, the 80s delivered the advent of scooter choppers which rose to the pinnacle of their popularity, with the road riding and custom ends of the spectrum. Kirsty Sohl-Osborne is co-owner of Tribal Ink Tattoo studio in Stoke-on-Trent. Her Vespa chop typifies the appearance of an 80s street scooter chopper. From a relatively early age, when her non-conformist traits first came to the fore, she’s had a taste for things outside the mainstream. “I’ve always been into the alternative scenes — music to start with. Since I was 11 or 12 it was the punk scene from which I crossed over into Oi! The base model Vespa PX was a surprise birthday present from Kirsty’s hubby some four or so years ago. However, things didn’t go quite to plan. 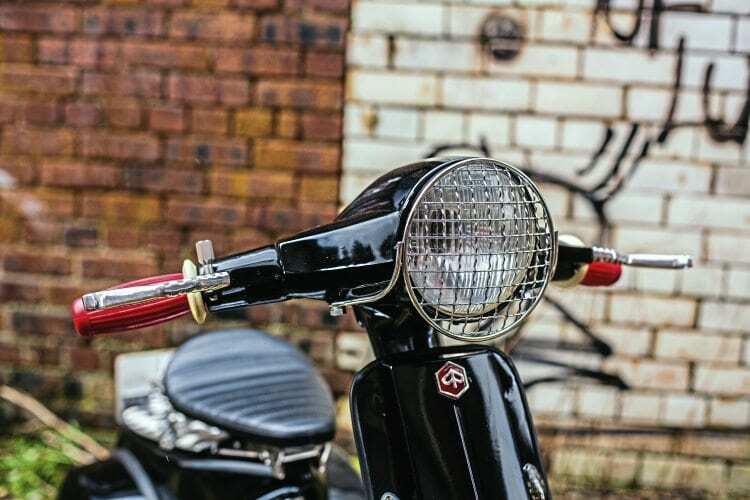 “It was a lovely surprise getting the Vespa for my birthday in 2013, he knew I’d wanted to build a cutdown. First it went to a friend of hubby’s car garage where they cut the bodywork down. Next, it went off to a local scooter workshop, I told the guy there what I wanted, and what ideas I had for my cutdown. He agreed to take on the work and said to leave it with him. 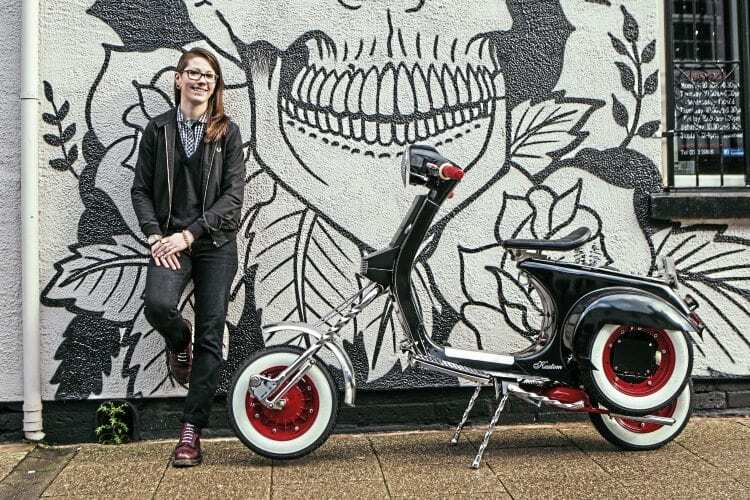 While Kirsty’s Vespa is unquestionably reminiscent of an 80s style chopper, it has a few twists, (and not only to the forks, kickstart and stand), to its makeup. 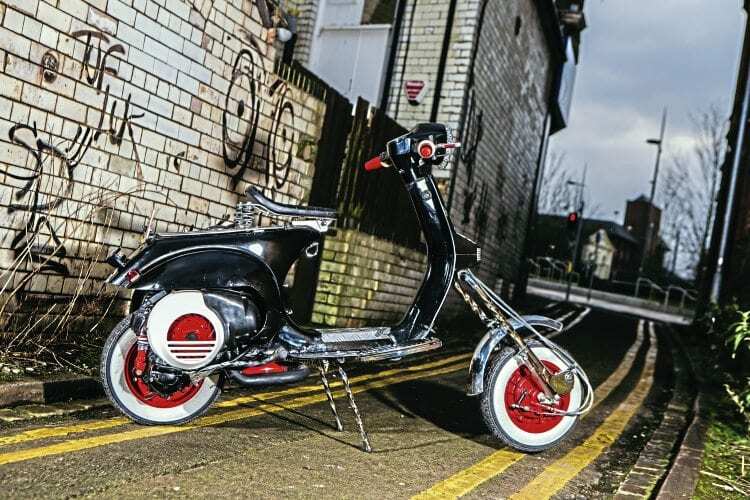 “It’s partly inspired by skinhead style scooters. My hubby has a Harley Bobber which also provided some of the inspiration for how I wanted mine to look. During the build, a friend of my hubby was selling a load of Harley-Davidson bike parts and among them were a set of floorboards which I bought. 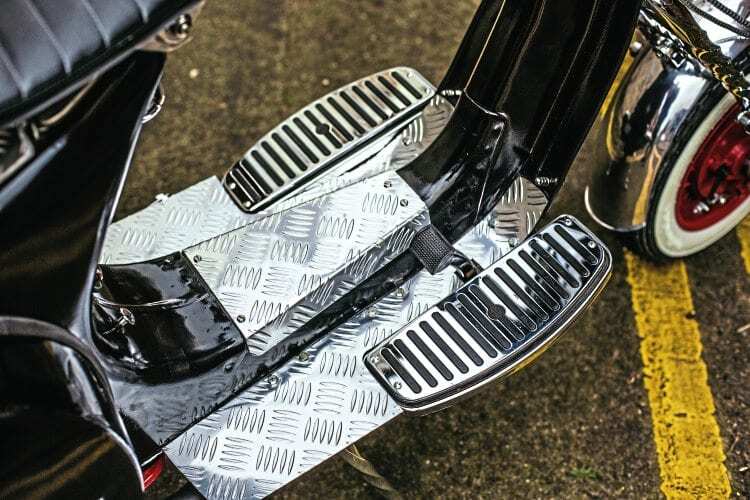 During researching the project I’d noticed some scooter cutdowns with skateboard type wooden floorboards, I put my idea of Harley boards surrounded by SIP floorboards trimmed to fit around them into practice on mine. 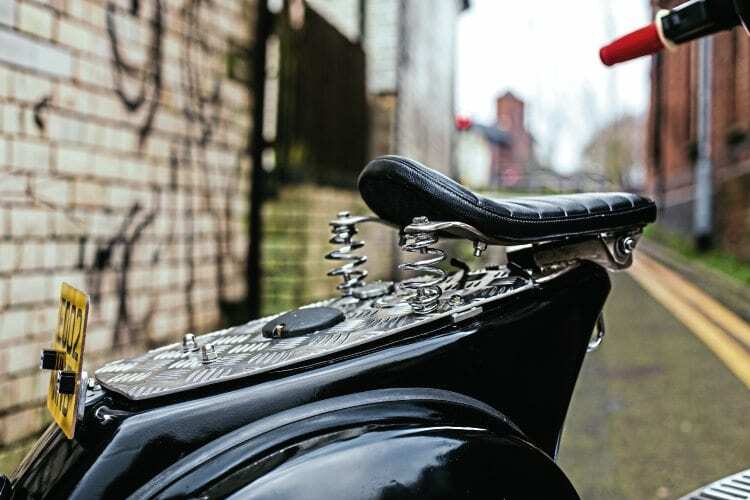 Another idea of mine is the handmade-to-suit springer seat. At the moment it’s still very much a work in progress machine. Kirsty hasn’t, as yet, clocked up many miles on her Vespa, the small matter of acquiring a driving licence is the main factor behind that minor setback. What’s in a name? is a question that’s sometimes asked. Kirsty bestowed the moniker Dark Destroyer on her scoot. 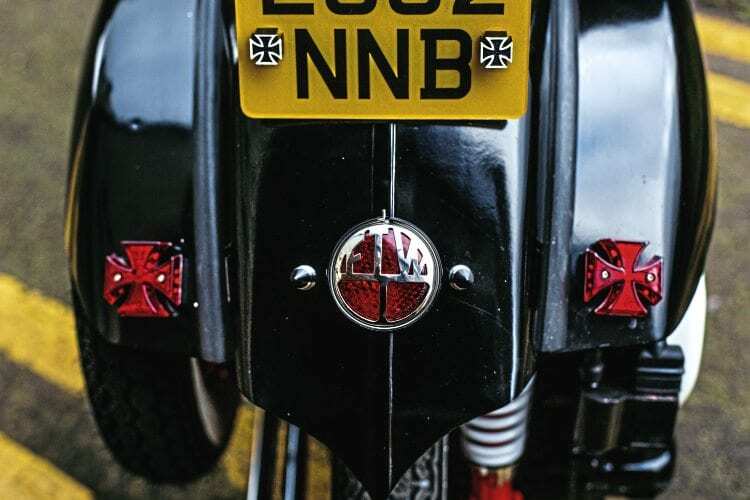 So what is behind christening her Vespa Dark Destroyer? Has her pride and joy been named after one of ITV teatime quiz programme The Chase experts, namely Shaun Wallace, who is known as the Dark Destroyer? Or, especially with its throwback to the 80s appearance, was 80s World middleweight and super middleweight boxing champion Nigel Benn, also known as the Dark Destroyer, where she lifted the name from? “I’m a real Star Wars geek. A star destroyer is one of the most powerful star ships in the films. I’ve put a twist to it with dark instead of star with it being black.” Which surreptitiously is in keeping with the 80s aura of her chop, as The Empire Strikes Back and Return Of The Jedi went on general release in 1980 and 1983 respectively. While there were lots of the 80s that are really not worth remembering, that decade did have its moments. Don’t let anyone tell you otherwise: the 80s were fun-filled times for those who knew where to find it. Job: Tattoo artist at Tribal Images, Stoke-on-Trent. 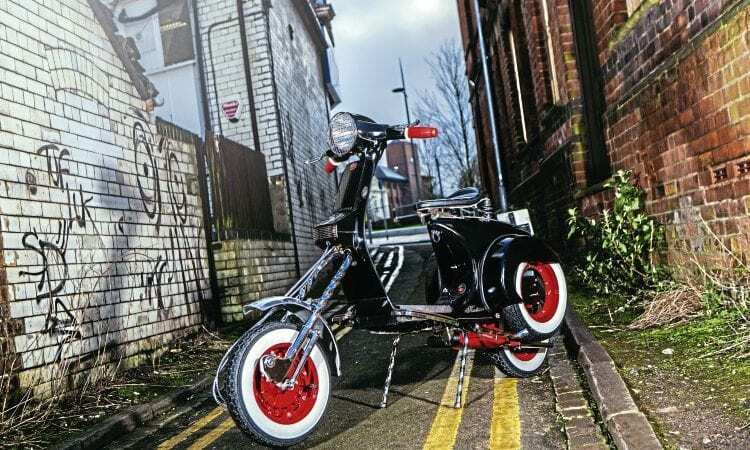 How and when did you first become interested in scooters: In 2009 when I first got in to the skinhead scene. I came across the old skellys and from that day I wanted a cutdown. What was your first scooter: This is my first scooter. I’d set my sights on a cutdown. What is your favourite scooter model: Vespa 125 VM1. What is your favourite style of custom scooter: Cutdowns and rat rods. First rally or event: Rock and Blues, 2010. What do you like about rallies/events: The friendliness and sense of belonging. Favourite custom/featured scooter of all time: Toss-up between ‘Vespeed’ or ‘Old School’. Both Spanish builds. 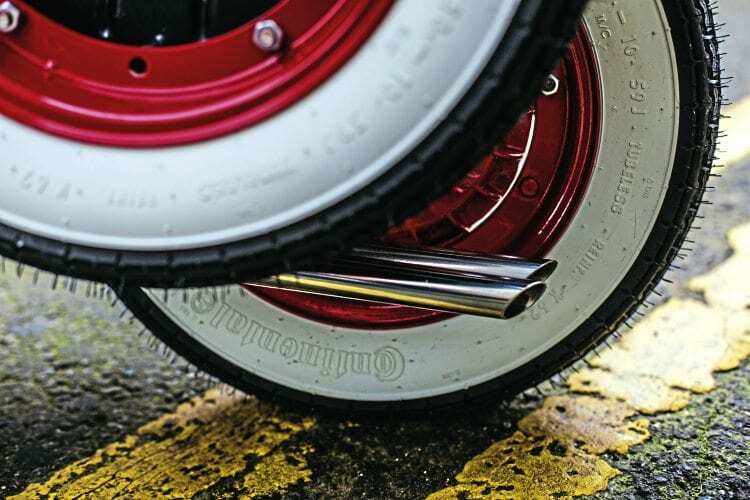 If you had to recommend one scooter part or item of riding kit what would it be: SIP Road 2 exhaust. Date purchased & cost: December 2013. It was a gift. Inspiration for project: Old skinhead skeliy and my husband’s Harley-Davidson bobber. Time to build & by who: Around two years in total, due to the initial time waster. However, majority of work was done by Craig and Mike at FS Scooters, Madeley, who had it completed within two to three months. They were great. Top speed & cruising speed: Cruises along comfortably at 60mph. It’s a cruiser not a rocket. Is the scooter reliable: So far. Paintwork & murals done by: Paint done by Craig & Mike at FS Scooters. 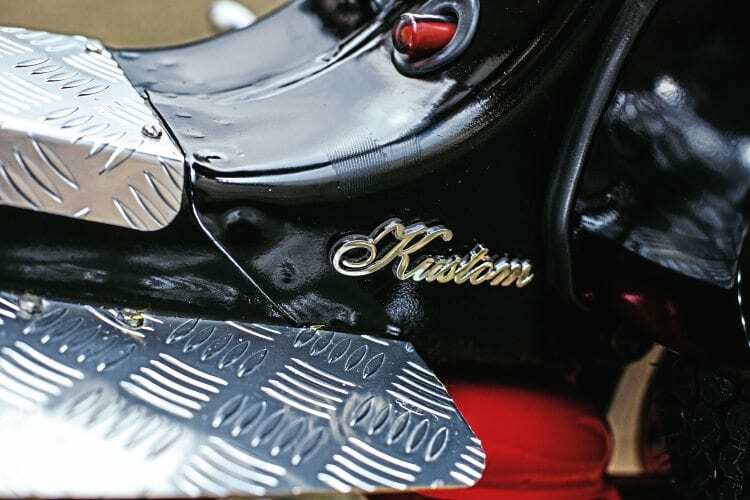 Is there any chrome: Twisted Chrome forks, kickstart and stands. Overall cost: Around £600! Scooter was a gift. What was the hardest part of the project: Putting right other so-called scooter expert’s f*** ups! Any advice: Take on board advice from others, have a clear goal and do your research. 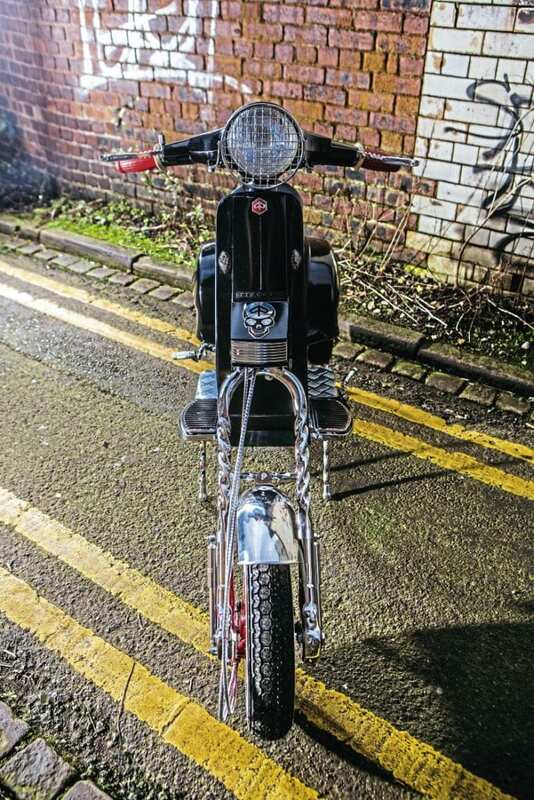 Is there anything still to add to the scoot: It will be resprayed soon and pin striping added. Is there anyone you wish to thank: Craig and Mike at FS scooters for all their hard work and support, Jam at Cargo Garage in Stoke-on-Trent for his storage space, my husband Oz for his generous gift, and our friend Watto for his assistance.